William Amine Hawi (also written: William Haoui), — (September 5, 1908 – July 13, 1976), (وليم أمين حاوي‎) is a Lebanese martyr. He was one of the major players in Lebanon’s struggle for its independence back in 1943. William Hawi joined the Kataeb Social Democratic Party in 1937 ( الكتائب اللبنانية‎) better known in English as the Phalangist party organization, a right-wing political party in Lebanon. He was appointed Head of the Second and Fourth Districts, President of the Recruitment Bureau, Head of the Department of Security, Sport and Mobilization on May 29, 1952, and member of the Political Bureau on July 12, 1952. In the fight for independence, he prepared and organized strikes and demonstrations. He also held secret meetings with An-Najdah (the rescuers) in his own mirror factory in Debbas Square. When the French found out about these meetings, they raided the factory several times and avidly pursued William Hawi, to no avail. 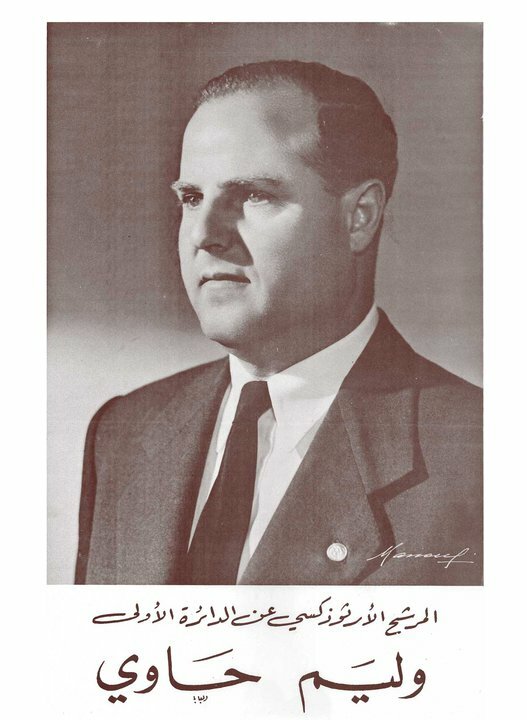 On June 16, 1958, William Hawi was in charge of organizing and leading the activists during the Lebanese events; this constituted the hub of the Party’s Regulatory Forces. On January 23, 1961, the Political Bureau dissolved the militants’ organization before including its members in the Lebanese Phalange Party and Hawi created the Regulatory Forces. On February 6, 1961, William Hawi was appointed Head of said Forces. In 1963, the “First Commandos” unit was created. It was followed by the “Second Commandos” unit, then by the “P.G.” troop. In 1973, the “Maghaweer” platoon was created and the “Combat School” established. Moreover, “Chef” William supervised the setting up of camps as well as the training organization and development, which enabled the progress of the regulatory process. In 1952, the Lebanese Phalange put William Hawi up for the Beirut Municipal Council in the Achrafieh-Rmeil region, where he obtained the largest number of votes. In 1957, Hawi presented himself to the legislative elections but failed. In 1975, Hawi was leading defense operations against the Palestinian attacks on the Souks of Beirut, Karantina, Jisr el Basha, Dekwaneh, Galerie Semaan and what is known as the “Hotels fight”. On July 1, 1976, the sources of the Lebanese allied forces announced the fall of the last bastion in Tel el-Zaatar and declared that the Head of the Phalange War Council supervised this operation. On July 13, 1976, William Hawi was killed in the middle of the battlefield in Tel el-Zaatar with a bullet in the forehead. Upon his death, Bashir Gemayel was appointed his replacement as president of the Kataeb Military Council, which later became the core of the Lebanese Forces.